Ivan Ostafiychuk was born in 1940 in the village of Trostianec, Sniatyn region, western Ukraine. From 1957 to 1960 he studied art in the Vyzhnytskij School of Art. In 1960 he moved to Lviv where he continued his studies at the Lviv Academy of Art thru to 1966. Ivan Ostafijchuk has exhibited his work in Ukraine, Europe, Canada and the United States. He has received many awards including a gold medal at the1980 IX Biennale for Graphic Arts in Brno, Czek Republic. Ivan Ostafijchuk is an artist who expresses his thoughts and emotions with great skill and imagination. His work is sophisticated and multi-layered. He conveys his interest in myths and legends through a unique symbolism based on the decorative imagery of traditional folk art. In Ivan Ostafijchuk’s art, everyday images become universal symbols. He imbues his compositions with vibrant colours, and his lines and forms pulse with rhythmic energy. Ivan Ostafijchuk is completely dedicated to the continual development of his art. Ivan’s early professional career concentrated on printmaking and the graphic arts. His early linoprints reflect the popularity of folk arts among the Ukrainian artists of the 1960’s. Starting in 1963, Ostafiychuk participated regularly in regional, national and international exhibitions. His first solo exhibition was held at the prestigious Lviv Art Gallery in 1979, followed within a year by solo exhibitions in the cities of Ternopil and Khmelnytskyi. 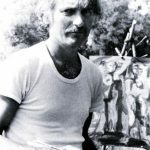 In 1980 Ostafiychuk was awarded the gold medal at the IX Biennale of Graphic Art in Brno, Czechoslovakia for his series of monotypes based on Ukrainian folk songs. Hutsul life and art have continued to captivate Ostafiychuk and have provided inspiration for much of his creativity to this very day. In the spring of 1987, Ivan Ostafiychuk left Lviv for Yugoslavia and in January 1988 arrived in Toronto, Canada where he settled. Extremely successful solo exhibitions followed in Edmonton, Montreal, Ottawa and Toronto as well as in Cleveland, Rochester, New York, Detroit and Los Angeles. Early in 1993, Ivan and his musician wife Dzvinka returned to re-establish themselves in a dramatically changed homeland after a very successful solo exhibition in Paris. He continues to work in his beloved Lviv and in a recently built studio in the Carpathian Mountains of Ukraine. In 2001, Ivan returned to Paris to seek further inspiration for his work. During 2002, solo exhibits of his work were held in Toronto, Saskatoon, Edmonton, Ottawa and Montreal. Solo exhibitions are scheduled in Chicago, New York and Lviv in 2003. Painting on glass has a long history in world and Ukrainian art. Ivan Ostafiychuk’s paintings on glass appeared in 1980?s alongside his paintings on paper and canvas. These works are inspired by motifs ranging from the religious through the folk arts and daily observations of contemporary life. The works exhibited at Calories in Saskatoon, Canada are the latest works to date in the continuing exploration of this medium by the artist.The acrylic on paper paintings, referred to as Paris series, reflect the artist?s impressions during his last visit to Paris in 2001. Beyond the thematic insights, each work demonstrates Ostafiychuk’s mastery of graphically expressive line and the use of a chromatically expressive and sophisticated palette.